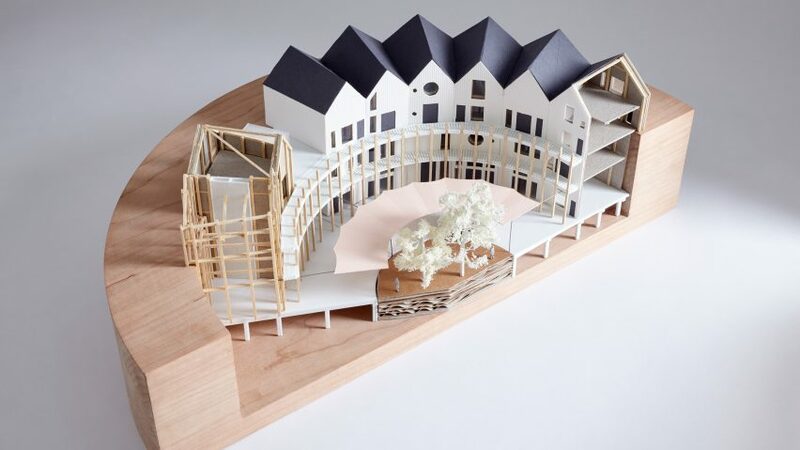 London studio Outpost has won a contest seeking ideas for how disused gasholders could be repurposed across the UK, with its concept for a ring of affordable housing and workspaces. The plans show a row of gabled buildings surrounding a circular well, which would be left behind after the latticed steel frame of a gasholder had been demolished. The blocks, which appear single height from the exterior, descend down into the pit to provide up to four storeys of affordable housing and studios. Outpost saw off five shortlisted teams to win the contest: CF Architects, 318 Studio, Max Architects, Wilson Owens Owens Architects, and Jan Verhagen and Priscille Rodriguez of Unit Architects. "The UK has a well-publicised shortage of affordable housing and somewhat less publicised, but of equal note, shortage of affordable flexible workshops, studios and workspaces in our towns and cities," said Outpost. "We saw the opportunity to develop a proposal that addressed these national issues in a simple and economical way." While there are no immediate plans to realise this particular scheme, Robin Sjoholm told Dezeen the studio would be pursuing the opportunity to adapt decommissioned gasholders. The contest, organised by RIBA Competitions for British gas and electricity network National Grid, asked architects to develop proposals to regenerate over 100 gasholder sites in the UK. The structures are gradually being taken out of use as technology has improved, allowing gas to be stored in the underground mains network rather than above ground. Swiss firm Herzog & de Meuron recently unveiled plans to convert Stockholm's former gasworks into a residential neighbourhood and in London's King's Cross redevelopment, Bell Philips created a circular park within the frame of an old gasholder. Also in King's Cross, WilkinsonEyre is putting the finishing touches on an apartment block built within a gasholder frame. The RIBA judging panel selected Outpost's "beautifully simple" mixed-use scheme for its sustainable, modular and cost-effective approach to the shortage of affordable housing and workspaces in the UK. "The decision to build out from the base structures, effectively lining the inside wall with a timber-framed, modular construction, is inventive yet pragmatic, the serrated roofline presenting a unique but familiar domestic appearance to the surrounding," said RIBA Adviser Russ Davenport of Newcastle-based studio Faulkner Browns Architects. "Key to their success was close attention to the brief and a solution which could easily provide a sustainable future for the country's stock of gasholder bases," he added. Wilson Owens Owens Architects' proposal for a sports venue was awarded highly commended in the competition. "We are excited that our sites can see a greater potential and purchasers will be inspired by these, and all the great ideas submitted will result in sites being brought back into beneficial use in a sustainable way," said Gasholder Demolition Manager Laura Watson.